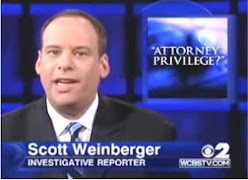 Tembeckjian and Friedberg whitewashed the criminal acts of 3 Judges who covered-up a politically active attorney's 9/11 Donation Fraud where over $120,000.00 in 9/11 donation cash was stolen, an insurance company was defrauded and a death occurred. 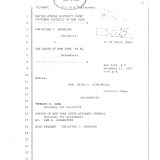 Tembeckjian and Friedberg also ignored another complaint where Surrogate Scarpino confronted the pro se litigant in the lobby of the courthouse to express his anger: "I don't like the fact that you asked me to recuse myself" and "I wasn't the judge when your brother killed himself" and "So where do we go from here?" 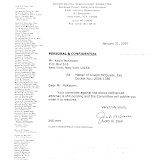 And Tembeckjian and Friedberg knew that other New York top administrative judges were also aware of the complaint against three judges for conspiring to cover up an alleged fraudulent court filed “assignment of interest” that was designed to prevent the repayment of over $120,000.00 stolen in 2001 from 9/11 donations made to the American Red Cross. 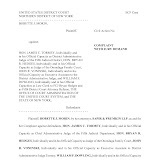 The judges named in the complaints are from Westchester County, in White Plains, New York: Surrogate’s Court Justice Anthony A. Scarpino, Jr.; former 9th Judicial District Administrative Judge Francis A. Nicolai; and Civil Court Judge Gerald E. Loehr. 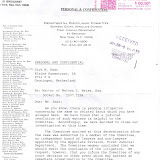 The allegations against the judges include the organized stifling of justice- and for one reason: to protect their political friend and supporter, attorney Frank W. Streng of McCarthy Fingar, LLP, who drafted and filed the alleged fraudulent instrument in November of 2003. The allegations include: judicial steering, corruption, denial of due process and obstruction of justice. 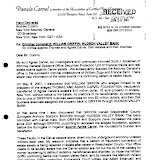 Surrogate Scarpino, who handled the Harry Winston estate and is currently hearing the Brooke Astor estate, refused to remove himself from the Tom Carvel estate proceeding when it was found that he had loans from one of the parties. 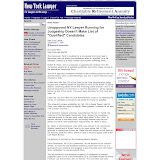 Also, it was reported that for over 4 years attorney Frank Streng advertised on the internet, and his law firm website, the fact that he was on Surrogate Scarpino’s election transition committee- a fact that angered many as Streng and McCarthy Fingar implied he had an "in" with the court. 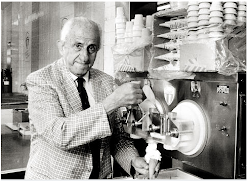 Mr. Streng, in various capacities, has also been involved in the Astor and Carvel estates. 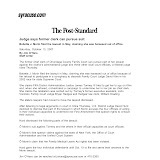 And as reported in the New York Law Journal last year, allegations of judicial steering are nothing new to the Westchester County courts under Administrative Judge Nicolai. 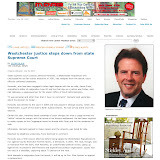 That brouhaha resulted in a large court organizational shake-up in Westchester. 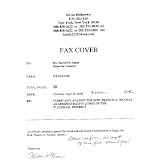 The underlying matter, The Estate of Margaret A. McKeown, has lingered in the Westchester courts since 2003, and the related 9/11 Red Cross donation fraud was subject of an April 28, 2006 article in The New York Times article, though the judges' names nor the allegations against them were not mentioned. 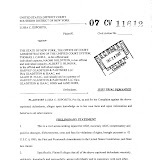 And though the alleged fraudulent assignment was filed in November of 2003, it would take until July of 2007 for the Westchester County Surrogate's Court Chief Clerk, Charles T. Scott, to “locate” the assignment papers and place them in the court’s estate case file. 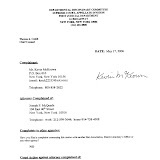 Oddly, and also in July of 2007, Chief Clerk Scott advised in writing that he had corrected the three and one-half year “administrative oversight” by "back-dating" the filing date in the court’s computer. 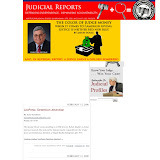 Surrogate Court court attorney Joseph M. Accetta, and who has close ties to Streng and McCarthy Fingar, has been recently implicated in the cover-up. Hon. 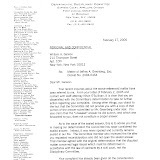 Anthony A. Scarpino, Jr.
5.1 All Times Relevant- The Justices were aware that attorney Streng had served on the Surrogate’s Election Transition Committee when the Court considered and subsequently granted monetary sanctions to Mr. Streng on June 8, 2004 and on June 1, 2005. 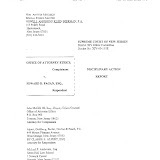 It is notable that from at least early 2004, Surrogate Scarpino continuously failed to present for remittal, or to disqualify or recuse himself while he was considering the thereto related filings and issues which resulted in the June 8, 2004 and June 1, 2005 decisions. 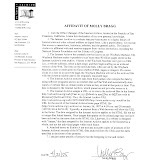 5.2 June 8, 2004- Surrogate Scarpino granted monetary sanctions to attorney Streng at the same time Mr. Streng was advertising on the internet and the McCarthy Fingar firm website that he served on the Judge’s Election Transition Committee. 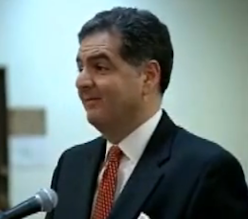 5.3 June 1, 2005- Surrogate Scarpino again granted monetary sanctions to attorney Streng at the same time Mr. Streng was advertising on the internet that he served on the Judge’s Election Transition Committee. 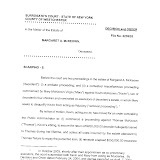 5.4 All Times Relevant- The Justices denied all requests to address the “fraudulent assignment” prepared, executed and filed by the same person who was advertising his implied favoritism with the court on the internet, Mr. Streng. 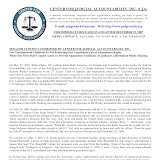 In fact, Judge Scarpino denied without prejudice to renew , indicating that the issue could be raised at a future time in the estate accounting phase. 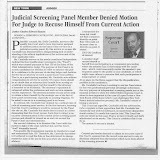 But in that very same ruling Judge Scarpino imposed a motion prohibition. And acting-surrogate Loehr immediately imposed a total ban of any motions at his first hearing. 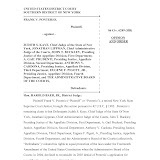 Notably, Judges Scarpino and Loehr knowingly and purposely avoided ruling on the fraudulent assignment prepared by their close political associate Frank Streng. 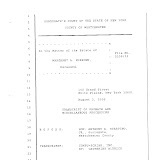 NYLJ, June 28, 1999, at 32, col 4 [Westchester]). 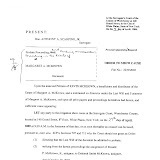 5.7 August 3, 2005- Westchester Surrogate Anthony Scarpino finally recuses himself from The Estate of Margaret A. McKeown, not on his own initiative but only after being requested to do so by the herein movant. 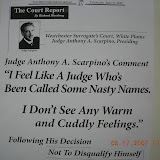 (Note #1: on the record in open court on August 3, 2005, Judge Scarpino specifically voiced that the case may not be transferred outside of Westchester County) (See Court Transcript of August 3, 2005 Surrogate Scarpino Recusal Hearing) (Note #2: Judge Scarpino recused himself from my Order to Show Cause which pointed to the Surrogate’s bias concerning attorney Frank W. Streng, who in these proceedings the Surrogate twice awarded financial sanctions to while attorney Streng was simultaneously advertising on the internet and his law firm website the fact that he was on Surrogate Scarpino’s election transition committee. 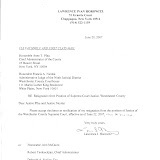 Judge Scarpino had denied motions without prejudice to renew concerning Mr. Streng’s drafting, executing and filing of a fraudulent assignment in the estate proceedings concerning stolen Red Cross 9/11 donation monies, but before any motions could be renewed Surrogate Scarpino Sua Sponte ordered that no parties could file any additional motions. There is clear bias here by Judge Scarpino to protect a member of his Election Transition Team by denying my right to due process, and by obstructing justice concerning fraudulent assignment inquiries. 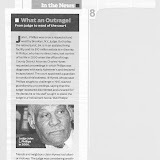 5.10 Judge Nicolai, I have since been informed, has had a long-standing political relationship with attorney Streng. 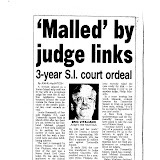 And at all times relevant, Judge Nicolai failed his duty to avoid the appearance of impropriety. 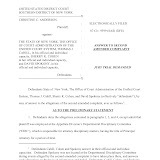 Subsequently, Judge Nicolai refused to transfer the matter outside Westchester County, choosing instead to assign the proceeding to the most junior county court judge, and longtime political associate, Justice Loehr. 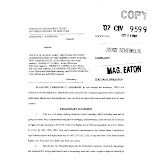 5.11 At all times relevant, Judge Loehr was fully knowledgeable of issues concerning the fraudulent assignment and, sua sponte, directed his own motion prohibition so that the issue against attorney Streng could be litigated. 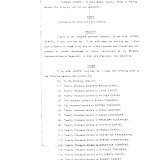 6.1 I believe The Justices have not only failed at all times during the estate proceedings to Avoid the Appearance of Impropriety by not presenting for remittal the known issues as presented herein, or by disqualifying or recusing themselves. But they collectively participated in a scheme to cover the misdeeds of their political friend, Mr. Streng. 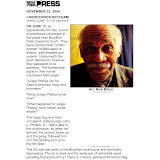 At no time did any of The Justices act in a way to assist in the $100,000.00-plus repayment of the stolen 9/11 donations. 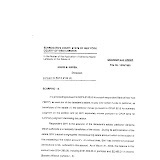 The Justices grossly failed their duty to insure judicial integrity and impartiality of court proceedings in the Westchester County Surrogate Court. 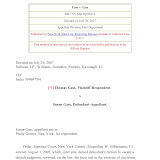 6.2 I believe The Justices knowingly failed their judicial oath by denying due process and, remarkably, concerning an issue where their own close associate, attorney Frank Streng, filed papers meant only to prohibit the return of over $100,000.00 in 9/11 donations stolen from the American Red Cross. 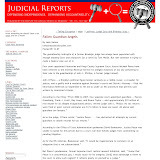 6.3 I believe appropriate inquiry and action is necessary as The Justices knowingly and with purpose chose to ignore their judicial obligation to submit for remittal, recuse or disqualify, or to correct any of the troubling acts against due process and justice. In fact, while ignoring their duty to avoid even the appearance of bias and impropriety, The Justices took deliberate action to thwart the right of due process, obstruct justice and disgrace simple decency by their acts against 9/11 victims. Officials of the American Red Cross say they try to recover ''every last dollar'' lost to theft or fraud, but a Connecticut case involving the theft of $120,000 has raised questions about that commitment when it carries the risk of bad publicity. The Red Cross is under intense scrutiny over its response to Hurricane Katrina, including accusations of fraud and theft of relief supplies that volunteers say were ignored for months. 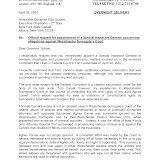 In the Connecticut case, the Red Cross settled for less than half the money from its insurance company rather than pursue the full amount through litigation even though the agency was urged to do so by the suspect's brother. The brother, Kevin McKeown, said he was told by a local chapter official that pursuing the money would make the agency look bad. 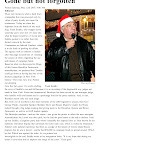 ''They were worried that any further publicity would create a scandal that would harm their fund-raising,'' Mr. McKeown said. National Red Cross officials now argue that a lawsuit would have been expensive and that success was far from certain. Volunteers and former Red Cross executives say the organization often places a higher priority on avoiding scandal than recovering stolen money, and a former president of the Red Cross, Dr. Bernadine Healy, offered support for that view. 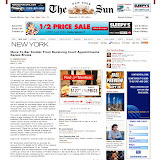 In an interview, Dr. Healy, who was pushed out after the terrorist attacks of Sept. 11, said the Red Cross board criticized her for firing the executive director of the Hudson County chapter in New Jersey, after she learned that he and the bookkeeper had embezzled almost $2 million from the organization. 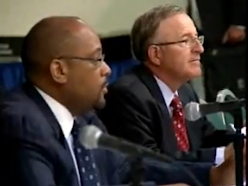 ''They told me I was too tough and too fast in firing the guy and moving in on this fraud,'' Dr. Healy said. ''I was told the way to handle these things was quietly and that nobody needed to know.'' 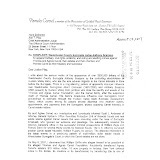 Melissa Hurst, the Red Cross's assistant general counsel, disputed Dr. Healy's recollection. ''The Red Cross pursued that, and it was supported throughout the organization,'' Ms. Hurst said. The Connecticut case is full of legal twists and turns. 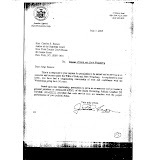 The suspect in the case, Ronald P. McKeown Jr., was the executive director of the southeastern Connecticut chapter of the Red Cross from July 2001 until he resigned on March 1, 2002. 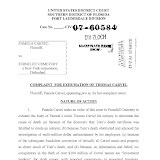 Eight months later, he was charged with larceny, money laundering and forgery in connection with the embezzlement of more than $120,000 collected by his chapter for the families of victims of the Sept. 11 attacks. Almost a year after he was charged, however, Mr. McKeown committed suicide at age 52. His brother Kevin said his mother had been working on a plan to repay the Red Cross with her own money when she died in August 2003, leaving an estate of more than $1 million. 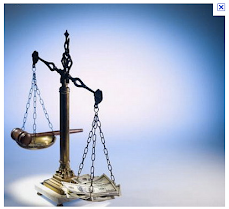 ''We were hoping the repayment of the money would somehow lessen the criminal outcome of the charges,'' he said. The money to make good on that desire then became entangled in a fight over his mother's estate, and Ronald McKeown's death put it even further out of reach because he signed documents transferring his part of the inheritance to his recently remarried former wife. On Tuesday, Mr. McKeown learned via an e-mail message from the insurance company that it had decided to try to recover from his brother's estate what it had paid out to the Red Cross. In recent months, critics of the Red Cross have questioned why it waited months to address accusations of theft and fraud in the New Orleans area after Hurricane Katrina, charges that have led to investigations by the F.B.I. and the Louisiana attorney general's office. 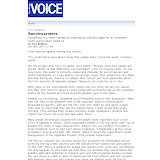 ''From what I've witnessed and what I've been told, they don't go after everything they find,'' said Michael A. Wolters, one of the volunteers who made the accusations in a report he filed with the organization. Mr. Wolters said he was involved in uncovering fraud involving a police officer in Texas who obtained Red Cross debit cards and handed them out to law enforcement officials. ''He had access to just go get these cards and not even sign for them,'' Mr. Wolters said. ''Who knows how much he took? 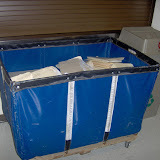 We turned over reports documenting about $400,000 that was missing.'' Ms. Hurst said the matter involved $360,000 and had been turned over to law enforcement officials. wow. 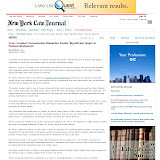 what the hell is going on in westchester county? Don't forget the Presiding Justice of the 2nd Department, A. Gail Prudenti...... she's in charge of the 9th Judicial District and Westchester.... and she's done nothing, nothing, nothing. 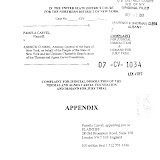 Did Prudenti know about the 9/11 donation fraud covered up by her judges? When are the FEDS going to pick these THUGS up? They have Plenty of EVIDENCE!!!!!!!!!!! 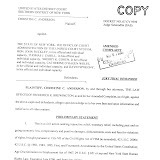 Watch one element in the Silver/Lippman/Streng/Scarpino/Spano/Difiore CRIMINAL ENTERPRISE, a one Hon. 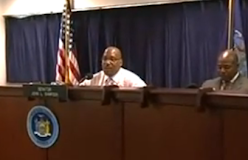 tony Scarpino preside over one of the most amazing Surrogate ripoffs in the county, the Fred Goetz Estate hearing...and District Attorney Janet DiFiore was seated to turn a blind eye to the flow of dirty money in the county. The corrupt of OCA don't care if tey kill, mame or destroy...they are sociopaths with no regard or empathy FOR anyone..but themselves. This personality type is prolific within OCA administration and that is exactly what they look for in interviews.....while chucking resumes. I know many female employees in hack supervisory positions..that have no education beyond high school, have passed no civil service exams even though they have TAKEN them, and have dispositions of monsters colder than murderers...and they remain and get promoted often within OCA...absolute fact in upstate NY! 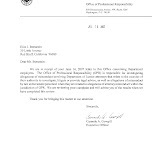 Do not look for human qualities in OCA employees that are screwing you...as they are hand picked for the distinct purpose to harm everyone who gets in their way...and these devils always do the deed. These creatures have to be removed to change the judicial makeup that would promote human fairness and justice. I worked with these hags...and God help you...they are extremely disturbed and not getting any help as they enjoy the power that mental illness and it's disturbance bestows on the huge number of innocent bystanders. This disorder is their fuel and power to work..they believe that they are in charge of all life...and most people allow it! 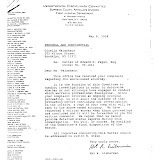 The feds had evidence in 2006 against OCA..but as a female FBI agent was describing the anomalies in the document that I presented to her..... the MALE in charge..of course... saw that she agreed with me that the item was tampered with....shut her down and walked out of my home! 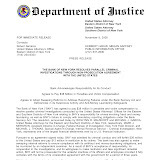 So if you think the FBI is not aware of court corruption..think again....they are avoiding it for some reason much to the destruction of the American and NY state public. 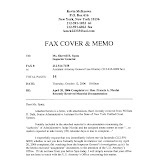 FBI you need to provide answers why you did not address court corruption back in 2006, Jan..when you had solid evidence...but walked away as if you were protecting OCA! Kevin - I applaud your fight, I feel the pain that has not been buried with your brother over these assholes. I practice in Westchester and am quite glad that some of the bad judges are finally being held accountable. Most members of the bar realize that it has been a very nasty environment around the 9th JD. And if you don't play, you'll be ruined. 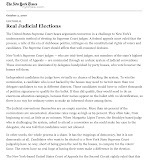 Yes, by the likes of Judge Nicolai. I would support the immediate removal of these three judges. This post is a little too long, but well worth the read. I can't believe this. How does this happen? Aren't there administrative supervisors? Looks like a big coverup to me. 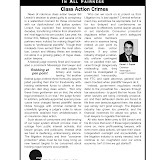 Upstate Adirondack Missing Witnesses Detail questions what is becoming of Scarpino now as heard he simply went in to private practice with Al DelBello, former Lt. Gov to Mario. Whatever happened to the Sharon Enea investigation? Possible Murder in the Carvel Estate case?